Making a strong first impression is imperative when exhibiting at a show and the right Exhibition Display behind you can go a long way to helping with this. 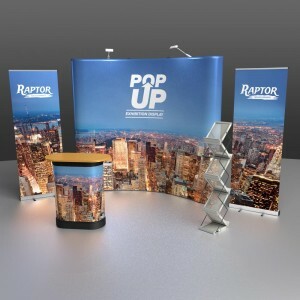 From well designed roll-up banners to large stands incorporating televisions and computers; there is a solution to every budget to help you give the right impression. Try to avoid any prices or dates on the main stand items. This instantly puts an expiry date on the display. 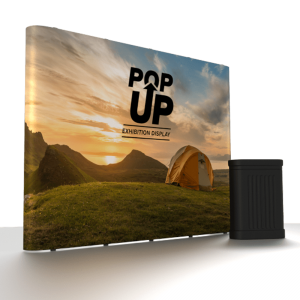 It is much better to put specific and relevant information on posters or smaller displays and use them to decorate than to date the background. Images paint a thousand words! Often people will walk past and establish if your services are of use to them without having to break their stride. Images can tell a story a lot faster than words can so it is well worth thinking about image use. The best combination would be some fantastic images and a few snappy text sections to further make your point and explain what you are offering. As soon as you know your exhibition space then get in touch with us and explain what type of show you are attending and what you are aiming to acheive at it and we can discuss the best options to allow you to achieve that without pushing costs sky-high.